Authorities in Kenya's capital say they have unearthed a syndicate stealing the city's water to irrigate farms. Nairobi City Council says nearly half the capital's water was being diverted by dealers working with officials at the water distribution department. "We know there are cartels. We are cracking down on them," Mbaruku Vyakweli of the Nairobi City Water and Sewerage Company told the BBC. There has been widespread rationing across the capital in recent weeks. Health officials have warned that Nairobi may soon experience outbreaks of water-borne diseases. Earlier in the week, the board of the Nairobi City Water and Sewerage Company was sacked for mismanagement. Mr Vyakweli says he now hopes the syndicates will be crushed. "We're working closely with the police and we're moving from one area to another," he said. 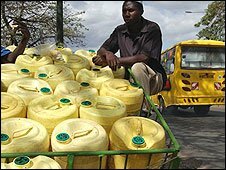 The BBC's Anne Waithera in Nairobi says water-sellers have been making a huge profit. "We sell around 400 litres a day," one water-seller told the BBC. 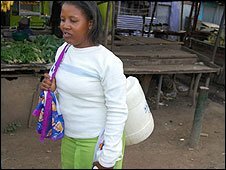 A 20-litre jerry can of water sells for between 50 Kenyan shillings and 100 Kenyan shillings ($1.30). Residents in BuruBuru, a suburb in the east of the city, have had no water for three weeks. "I can't wash today because there is no water - I don't know where I can get it," one local resident told the BBC's Network Africa programme after failing to find water. Our reporter says the severe water shortage has been compounded by low water levels in Ndakaini Dam, which feeds the city with water. The dam has a capacity of 70m cubic metres but it is now down to just more than 26m cubic metres. Environmentalists are attributing the low water levels to the failed rains and the destruction of the Aberdare forest catchment area in Central Province. Three of the four rivers that flow from the Aberdare forest to feed the Ndakaini Dam have dried up. Mr Vyakweli said the only hope for Nairobi is that the short rainy season expected in September and October will be plentiful.